Studies show that most turkey season shooting incidents involve experienced hunters accidentally firing on another hunter. Follow the safety tips below for a safe and successful turkey hunt. If you see another vehicle or suspect another hunter is working the area, move to another area to avoid interaction with another hunter. While walking, it's a good idea to wear blaze orange. Keep in mind turkey sounds you are hearing may not be coming from a turkey. Assume that every sound you hear is made by another hunter. Stalking a turkey is a common cause of hunting incidents. Don't stalk birds; call the turkeys to you. Establish a position whereas your back is against a tree trunk or large stump wider than your shoulders, higher than your head, and you can see for at least 40 yards in all directions. Don't hide in a place where your view is obstructed. This helps protect you from an errant shot and the good vision of the turkey. Avoid all unnecessary movement. 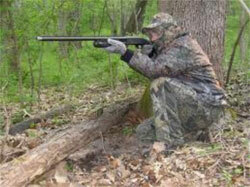 When you move slightly, you are visible to both turkeys and hunters. To protect yourself from other turkey hunters, never wear red, white, blue or black. Be careful when using decoys. Never carry or move an uncovered decoy. Do not place yourself directly in line with a decoy. Be careful when using a gobbler call; the sound may attract other hunters. If other hunters are in your vicinity, announce yourself loudly and clearly; do not move, wave, stand or make turkey sounds. Do not shoot at sound or movement. Be completely sure of your target and what is beyond. You must see the whole bird to determine whether it's safe and legal to shoot. When you carry your turkey out, have a neutral colored or blaze orange bag for your bird in the event you walk by another hunter. When walking in the dark, use a flashlight. 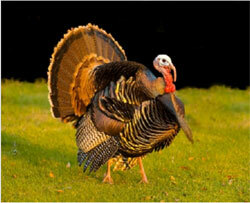 Follow the recommendations above for a safe and successful turkey hunting season. Although statistics show that turkey hunting is one of the safest sports there is, accidents do happen. As always, hunting lease liability insurance is recommended in order to limit the exposure of hunt club members, guests, and landowners in the event of an accident.